We are in Virginia Beach, Virginia, USA. Besides local businesses, we offer fast and free shipping to mainland USA from Virginia for all art supplies. Europe, Oceania, and Canada customers are welcome to contact us for "Free shipping from China". However, we do global shipping from USA at lower rate than official quotes. Discount for local artists purchase in person? Do you offer sumi classes? We currently offer local private painting and calligraphy lessons normally in the store from 6:00 pm to 9:00 pm, and other hours and locations as demanded. Local students are welcome to contact us for schedule. Taking care a brush is protecting the tip of a brush. The new brush head has been applied glue to stick all hairs together. Some brush heads can be opened by gently squeezing by your fingers until the whole brush head becomes soft, then rinse the brush head by water for couple minutes to remove loose hairs and glue. But some brushes need soaking: Soak the brush into low-temperature warm water for several minutes. Please do not soak too long time, because the glue at the root part of the brush head is important and should be kept. Old saying: a Xuan Brush dose not need to be soaked and a Hu Brush needs. However, in the current market, this rule is outdated. For example, most ShuagYang brushes, the No.1 Brand, can be opened by fingers, but the fine script one still needs to be soaked. Most finger-open brushes are good for soaking method, but some do not. So when getting a new brush, try finger-open method at the first. To remove loose hairs, rinse the brush by running water again to clean all glue as the picture shown. It is important to (1) follow the direction of the hairs, (2) by the small stream of water. Then it is ready to use. The life span for a brush very depends on the proper usage. How to dip ink and color is a big issue. Whatever a new or used brush, fully dipping in water before dipping in ink is critical for hairs. Never dip a dry brush to ink or colors even if they contain water. Wetting the brush before grinding ink and preparing paper is a good idea. Or wet the brush twenty minutes before dipping ink. After wetting the brush, "dry" the wet brush by a piece towel or used rice paper ( the best way is dragging the brush on the paper to get off extra water). This is for the better ink result. Forgetting and inadequate cleaning after usage are enough to ruin the tip and inside of the brush head. Two ways to clean: (1)Rinse the brush by the small stream of water following the direction of the hairs, as the picture. Or (2) Rinse in a water container then change water, and repeat until water is clean. The plastic cap is to protect unused glued brush head. Never use the cap again, and it is just for the new brush. Keep this in mind: dryness is the key. Hanging brush to dry is the best. Laying down the brush to dry is OK but not perfect due to the gravity. For same reason, do not use a pen pot to dry. Storing brushes in a box, in a roll up organizer or hang them is better for brush tips. If the brush head is squeezed or compressed, game over. Q: Similar paper is described in your stores as Tapa/Paper mulberry paper(构树/ 構樹), but it is called Mulberry paper (桑树/桑樹) by other sellers. How different? A: We do not explain other sellers’ answers, however, basing our acknowledge and researching, in the current market, all of them should be stated as Tapa (paper) mulberry paper, whatever, produced in Taiwan or China mainland. Tapa mulberry, or paper mulberry, belongs to mulberry family, and wildly planted in China mainland and Taiwan for its economic value and easy fast growth. Tapa/Paper mulberry trees can be harvested in one years. Their bark is high grade paper making materials. The leaves are widely used as animal fodder. The seeds, roots and liquid of trunk can be used in medicine. Paper industry depends on local agriculture and forestry producing. In current market, Tapa/Paper mulberry is the most accessible materials in China. We have read so many news and article papers about in Puli town, Nantou county, Taiwan (台湾南投埔里) utilizing Tapa/Paper mulberry for producing high end papers. In Taiwan Tapa/Paper mulberries trees are called 鹿仔樹或鹿兒樹. In China mainland, they are called 构桃树、楮树、楮实子、楮树、沙纸树、谷木 、假杨梅. On the other hand, 90% of silk in Taiwan comes from China Mainland, thus silk produce is not popular in Taiwan, so mulberry trees are not wildly planted there. Ma papers are very different in each part of China, but one common trend in China mainland and Taiwan is to make Tapa/Paper mulberry bark as the substitutes of ramie fibers because of the scarcity and price. China is a large country. Due to the dramatic difference of the producing methods in each geographic region, Ma paper in Taiwan is white and thick; in Gansu, it is brown and thin; in Sichuan, it can be yellow, brown or white; in Jing County, it is gray-white, etc. These varieties are caused by the traditional production methods are different, even if the main materials are the same. Therefore, in current market, almost all “mulberry papers” should be called Tapa/Paper mulberry paper, and the Ma paper can be considered as a type of Tapa/Paper mulberry paper. To say frankly, sumiestore.com customers’ prudential observing and thinking sometimes surprises me. This kind of customers are highly welcomed and appreciated. As a Sumi-e art supplier or a Sumi-e artist, learning and exploring is endless, because the economic environment, the market and the users’ habits are changing. Everything now is so different from the ancient book sited in the library. Sumi-e is art, but Sumi-e supplying is about engineering and economics. Q: How to prepare a new Duan Yan (ink stone) to ready to use? A: A set of kit is included in the package. Which is for initial, clean the ink stone. There is a picture manual for direction. The kit is for the whole life of ink stone, so years latter when the ink stone getting dull, the tool in the kit set will help sharping the ink stone. Some users believe goat hairs brushes are made simply by goat hairs, and weasel hairs ones are made only by weasel hairs. This is a misunderstanding. Actually unless special ones, almost all brush hairs are formula, or say, a combination. To balance the softness / stiffness, absorbing, flexibility, tanned bristle, badger hairs, horse hairs e.t.c. are common accessories. For example, Shuangyang, the top 1 brand in the world, states their goat hairs brush are composited by “Goat Hair Bristles and accessories”, or “Goat Hair Bristles Horse Hair and accessories”. Their weasel hairs are same. If a brush could be simply made by one single kind of hairs, brush factories would not maintain their detailed formula in secrecy. Good factories and sellers disclose materials as clearly as possible, but the exact portion of each component is the business secret for factories. When accessories added reach the industry standard, it is called Mixed Hairs Brushes. Otherwise, brushes are named by the main material. This is thousand-years naming rules. The portion of accessories have been increased in past decades, but this is not a profiteer behavior as some users believed. For decades, farm raised animal hairs have dominated because wild animals have been protected by laws. Farm raised animal hairs are softer, therefore compared to what on ancient books, more stiff hairs are added in the formula to enhance the elasticity. Now we back to the first misunderstanding, in the current situation, a long head brush simply by goat hairs is almost not unusable—cannot back to the original shape after applying one stroke. However, too much accessories added make the brush rigid and hard to use. How to balance the formula is a challenge. This is another reason for the factories to keep the detailed formula secrecy --- good factories maintain their advantage in competition; bad factories seal their cheap accessories. Some users purchased several bamboo shaft brushes and got upset by the textures of shafts are different. Unlike wooded shafts which are painted uniformly, bamboo shafts are from natural bamboo. There are no two pieces of bamboo stems are exactly same in the world. Some user is confused about the horse hairs are added in weasel brushes. From my understanding, beside reasons have discussed, horse hairs are longer than weasel hairs, and are good to make long head brushes which is a trend in the current market. It is hard to find a weasel hairs brush with the head longer than 5cm. High grade manmade fibers are more expensive than animal hairs. Meanwhile low-grade fibers are really cheap. Utilizing manmade fibers or not , as well as the portion and quality used, depends on factories’ experience and ethic. When purchasing inventory samples, I did encounter couple low quality brushes-- the fibers added are awful. Therefore, good suppliers select the factories very carefully. Zisha or say Yixing clay is the special clay for YiXing tea pot. The feature of large size of clay pieces limits the volume of producing, but the demand is high. Some people mix other mud and chemical materials to "create" Zisha, and utilize methods of mold filling or pottery to quick mass produce . As same as fake ink, this kind of materials harms human healthy. When washing by boiling water or opening a new tea pot, if the smell is aroma or stink, it is fake. The smell should like mud or soil. Regardless sellers' pictures, the new Yixing tea pot should not be glossy. The glossy of a tea pot is cultivated by years of using. Many colors are available for Yixing clay, but the color dose not catch eyes. Too red, too green or too other colors are chemical added. Black sand has been used out for years, so be careful about black teapots. Keep brewed tea with/without leaves in the teapot for days. The smell inside of a fake teapot is sour/spoiled. Sumi e ink is traditionally composed of pine or oil soot, natural glue, Chinese medicine and spices. Graphite and other carbon-related natural materials were popular during early periods, until they were substituted with pine or oil soot. The black ash solidified after the pine is burned is the raw material for the pine soot ink. Correspondingly, oil soot results from burning many kinds of vegetable oils or lard. ​Pine soot particles (shown above by microscope) have diameters of 20 to 300 nm. The particle sizes are mixed randomly causing irregular reflection which produce the black with absorbent thickness with a single light source, as shown above. ​Oil soot particles (shown above by microscope) have diameters of 15 to 50 nm. The particle sizes are relatively homogeneous, causing regular reflections which produce a glossy black with a single light source, as shown above. This explains why pine soot ink is darker than oil soot ink, and why oil soot ink is more gloss than pine soot ink. Pine soot ink is usually used for calligraphy; as well as landscape painting, especially for smoky clouds and mist. Oil soot ink is usually used for calligraphy; as well as flower and bird painting. In the 1970’s, machine burned soot was adopted in ink making. 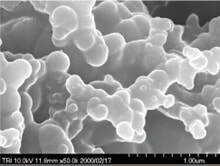 The particles of machine burned soot are much larger than those of hand burned soot, and machine burned soot particles are also more unevenly distributed, as shown in the following picture. ​When painting, this results in layers of ink color that are inferior. For this reason, ink sticks over forty-fifty years old (made before 1970’s) are significantly more expensive. These pictures are from research by Boku Undo Co. LTD of Japan (墨运堂). The quality of glue used in ink is very important. Animal glue is traditionally used and is the standard and the core when making Sumi ink and mineral colors. Good factories usually use glue from ox skin for ink sticks and solid mineral color cubes, and from ox bone for liquid ink or semi-solid color products. Adhesion. 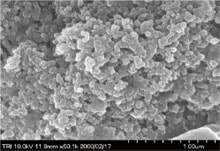 Because the molecule weight of soot particles is heavier than that of water, the free amino and carboxyl groups in the glue react with the hydroxyl and carboxyl groups on the surface of carbon black to connect each other and disperse evenly in water for a long time. With the help of glue, different results between thick and light ink can be presented. Lubrication. It can reduce the friction among particles of soot, brush and rice paper. Gloss and transparency. Glue can better create ink layers and glossy on rice paper. When applying ink by good glue, the ink soot of the first stroke is firmly attached to the paper surface, and it is not easily dissolved by water in subsequent strokes. This results in a better presentation of overlapping layers, which is one reason the effects of hand-ground ink from a good quality ink stick are better than those of liquid ink. The ingredient in liquid ink that prevents rapid drying makes the colloid dissolve easily in water again, resulting in an inferior presentation of overlapping layers. Nevertheless, the effects from liquid ink are superior to those from a poor quality ink stick. Of course, if ink stick glue is too strong, that will also cause problems. When relatively strong glue is used, soot particles hold together more tightly, so that finer soot particles are produced when grinding the ink stick. Years ago, there was an unfavorable trend of using very weak glue for ink, especially in Japanese products. The most obvious sign was ink sticks that would break after only a few years. Additionally, the black would drop off slightly after the paper dried. On the other hand, if glue is too strong, that causes problems too. The correct portions of good quality materials and a proper production process are the keys to good quality ink. To demonstrate why animal glue is the standard and core of Sumi ink and colors, we must emphasize some essentials of Sumi art. For example, by controlling water and ink, ink can be divided into the full spectrum of ink colors: dry, wet, thick, light and coke (the blackest). And to break ink, such as when “light ink breaks dark” or “dark ink breaks light”, ink must cover all linear changes of the dryness, wetness, thickness and lightness. Moreover, washing and shading require a full tonal gradient from clear to opaque black when diluting ink with water. 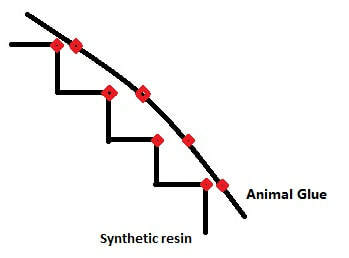 Despite this, many kinds of ink using industrial glue or synthetic resin are widely sold in the United States due to their relatively low prices. In some cases, they are sold at high prices anyway, which confuses consumers who end up paying for quality they don't get. Some Chinese medicine and spices help ink soot penetrate rice paper, enhancing color and gloss, and producing an enjoyable aroma. The situation in the current US market is not good, and even worse than that in China. It is full of fake and low quality products. Only a few sellers carry good Chinese liquid inks, such as the middle to upper level quality of YiDeGe (一得阁). No sellers carry good Japanese liquid inks, such as 玄宗 by Buku Undo (墨运堂) . For instance, one of the cheapest fake YiDeGe inks in the current Chinese market is selling in Hampton Roads area stores. The top one online retail platform had even marked it as a featured product, and many national online sellers carry it at a high mark-up. It is not a kind of YiDeGe ink, but a totally fake one as the following picture shown. ​A more detailed discussion of quality of ink sticks will be another topic. I do appreciate about any feedback on this paper, in person or via maple.woods@aol.com. Any feedback will be the basis for further modification. ​Are the raw rice papers really Raw?--Many Sumi e teachers even do not know. As the current trend, the raw rice papers with ink control function are dominating the market. When being used in painting, they are felt like 30% sized (semi-processed) paper, and ink result is good and much easier to handle. They are essentially different from alum sized papers which apply chemical alum to rice paper. As a supplier, sumiestore.com selects papers very carefully suiting for western artists’ situation. Lightly alum applied papers help ink controlling but they have many problems. Firstly, alum applied papers will gradually turn to fully sized paper, thus the papers are worse for freehand painting as the time goes on. Although it is not a problem for calligraphers, painters have to use all them out in a short period or waste money. Secondly, alum applied rice papers are not good for value appreciation at all. Alum papers trend to be rigid and even have holes after years of storage. Therefore, time is not the friend of alum applied papers. Raw paper with ink control, as named as physical sized methods, is not a new concept. They can be aged for value appreciation, help handle the ink and create great results. The paper by following common three physical processing methods are for raw paper, although they are not felt so raw. Red Star uses marble to grind the surface of ink paper to close the tiny pores of paper for ink control. In Chinese term, this is 玉版 ( YuBan). Red Star has increased the supply of YuBan in recent years. Be careful that other factories’ YuBan are not marble ground paper, but alum applied. If prefer YuBan, make sure to purchase Red Star only. MingXing and some other Chinese factories use special fishing skills to produce ink control raw papers. 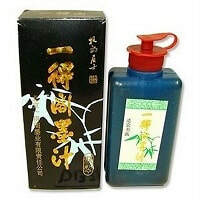 For example, MingXing Ink Immortal has been widely appreciated by Sumi e community and was named as “magic paper”. Adjusting the steaming time for Tapa mulberry bark makes Tapa mulberry paper owns ink control function. Producers do not disclose the details. My Tapa mulberry paper was adopted by SSA annual work shop 2016. Nowadays, the calligraphy skills of many Chinese Sumi e painters and most western ones are weak. Moreover, the paper usage volume of western painters is relatively low. Therefore, ink control function is critical, and the papers must be good for aging. Many of papers in sumiestroe.com are marked as raw paper and felt like 30% sized and ink effect is amazing. From the seller’s standpoint, aging paper for value appreciation is a good idea to balance lower paper inventory turnover. In summary, physical method applied raw papers are super than alum paper. And they are still raw papers, good for aging for better painting results and value appreciation.